Click the button below to add the The Perfect Fit Belt with Hidden Hardware to your wish list. This belt is made of three shorter lengths. 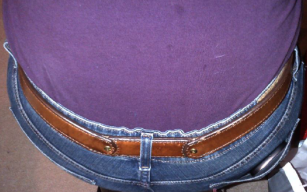 The shorter lengths make it much stiffer than a conventional belt. Why is this important? ~ It is conventional wisdom that the stiffer the belt, the more stable platform it provides. there is however, a point where stiffness becomes unwearable due to discomfort. This design allows us to make a considerably stiffer belt without giving up the comfort factor. Try one, you'll be amazed. This is a dual layer bull hide gun belt. We use 6 -7 oz., submersion dyed bull hide for the front and undyed 6 - 7 oz. bull hide for the liner. The two pivot points in the back allow your belt to instantly conform to your specific shape, and make minor adjustments for comfort with each move you make. 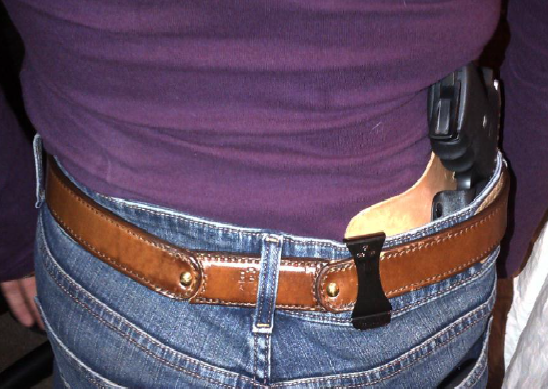 While this is the stiffest and most comfortable gun belt you will ever own, it is designed specifically for comfort. Competitive/tactical operators, with serious time invested in presentation, may prefer one of our Ultimate Gun Belts. The second keeper shown in the photos above is our snap-on keeper and is detachable and not necessary for the functionality of the belt. The pivot piece is reinforced three different ways, and guaranteed for life. Each pivot point is triple reinforced with hidden Nylon 6/6, two steel (or brass) grommets at each pivot, and a Chicago Screw locked in with Vibra Tite thread locker. For more information on the Perfect Fit Belt click here.